Owners Kevin Pereira (left) and Jhon Goodwin outside of Lost Boys Garage Bar & Grill. Jhon Goodwin and Kevin Pereira met in the choir 30 years ago at Ferris High School. 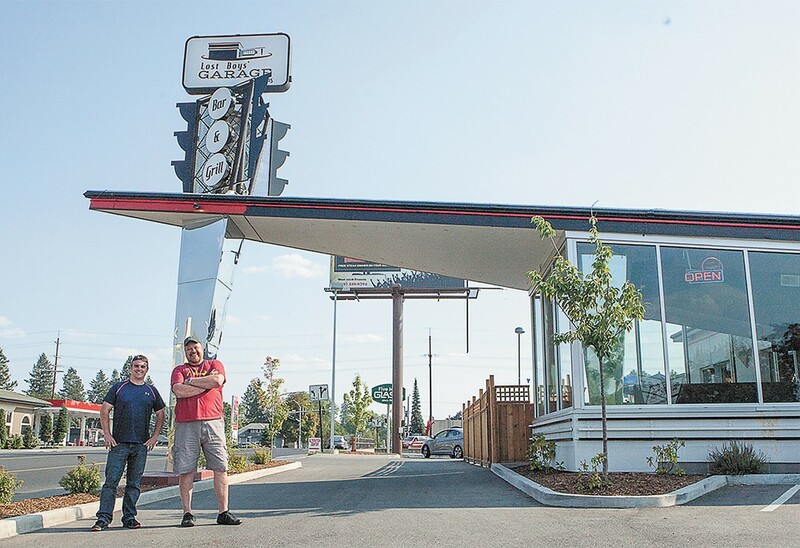 Today, they're the owners of a newly opened, automotive repair shop-themed bar and grill, Lost Boys' Garage. Since they first became friends, Goodwin and Pereira have met other guys through various jobs and other connections, leading to a tight crew. "We were all up at Spirit Lake during a boys' weekend when we decided that we were never going to grow up, and since then we've called our friend group The Lost Boys," says Goodwin. He and Pereira knew they wanted to open some sort of pizza place or bar where The Lost Boys could hang out, but after finding the old Stop N Go building for lease, they knew they had to open a garage. The menu stays true to the garage theme, split up into compact, mid-size and full-size. They mostly offer sandwiches, though there are creative smaller snacks like Texas Toothpicks — freshly battered and fried jalapeños and onions — and larger entrées like Not Yo Mama's Lasagna. Their happy hours, from 3 to 6 pm and 11 pm to close every day, offer a dollar off house wines, beer on tap and wells, along with $5 mojitos and mint juleps. Their cocktail list pays tribute to everything from car manufacturers to the Chrysler Building. Though Lost Boys' Garage will always be open during their posted hours, they'll stay open later depending on the customers. Their family-friendly dining area is open until 9 pm, and there's a patio connected to the bar. Goodwin is serious about customer service, wanting every customer to receive a "Disneyland level" of service. "Not that we're going to treat them like kids and dance around, but I want them to leave feeling like they were taken care of," he says.